Flat Stanley had quite a time while here in Juniata, NE. Weeks Farms is located in the South Central part of Nebraska. We have a large swing in climate during the year. In the summer it can get above 100 degrees and just a few nights ago it was -16 degrees overnight. On our farm, we raise yellow corn which feeds animals and makes ethanol; popcorn which you all probably consume on a regular basis; soybeans (which make crayons, ink for the newspaper, magazines, books, soymilk, feed for animals); and some hay which is also fed to animals. Flat Stanley showed up during a snowstorm and was able to take a ride on our Bobcat skid steer loader to move some snow. 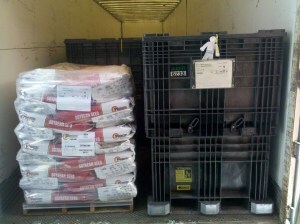 He also was able to help us unload a truckload of soybean seed that will be planted in April of this year and harvested near the end of September. To end Flat Stanley’s visit to our farm, we took him to the town of Hastings just a couple miles away from our farm. 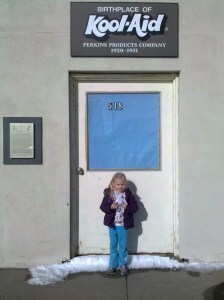 Flat Stanley took a picture with our daughter Brynn at the birthplace of Kool-Aid. It was invented in Hastings, Nebraska by Mr. Perkins. This was the highlight of the trip as Flat Stanley got to meet someone more his size, learn about how and where Kool-Aid was invented. Brynn was sad to see Stanley go and hope he comes back to visit again. OKAY! After I posted this, my friend Christy found this commercial that she shared with me on Facebook. I love that she found an old school Kool-Aid commercial shot on a farm! « Yummy Michigan Cherry Muffins!